Struggling, panting, the blisters on my hand about to pop. At the begining of the trip there was sun and no wind. And the water was smooth like glass. Now it was the complete opposite. There were constant huge waves and lots of wind like a tornado was coming. This was the first time in my new kayak and I thought I might not make in these conditions. I could not believe the instructor left me, an 8 year old, out here against all odds. “No I can do this” I replied. I knew I could do it and I would. Then a giant wave was coming at me. I had to get away. “Left, right, come on you can do it.” I whispered to myself. “Are you sure you don’t need help” my dad interrupted me in my powerful moment. “I’m fine.” I screamed back. I knew the waves were getting closer and I had to get away. 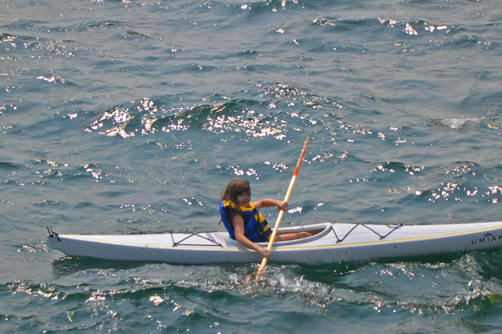 I kept paddling with all my might. My legs were cramping, wanting to be let out. 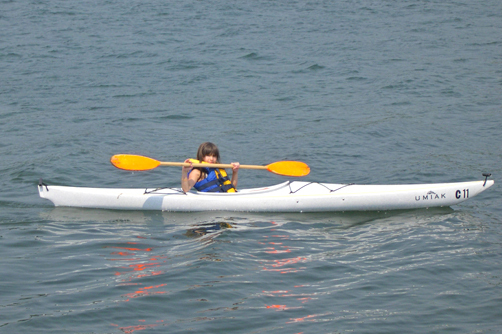 I was way to small for this kayak. The big wave was right next to me I knew I was going to capsize. I shoved the paddle in the water so hard I went 5 feet forward. I still hit the wave but not as hard as I would have. That was the easy part, now I was near the pavilion. I was scared I would be sucked under the dock and no one would be able to get me out. My parents had left the dock and I was puzzled. But then that thought was out of my head. 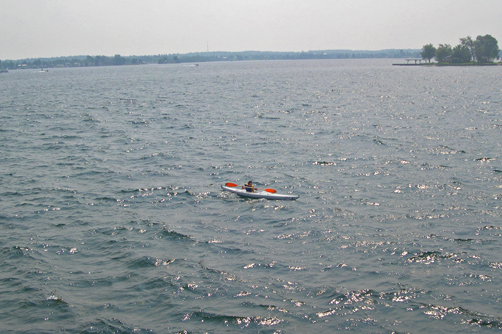 I had a new thought and that was who is in this boat coming right towards me. They were in a little boat and it was one of the other instructors. They asked if I wanted them to take me back. I didn’t want any help, I was fine. They kept asking if I was sure and believe me I was sure. Now I realize I would have liked help but I wouldn’t have had the accomplishment feeling. And I knew I could finish the trip, I just knew it. All I had left was 1/3 of the way to go. l I was almost there. I went around the bend in the river and now the wind was against me. It was 10 times worse than before now. Why couldn’t I have done sailing? That would have been easier. I wished the wind would have let up. Then I saw the rest of the group on the yacht club dock. They had already put their things away. The dock was so close to me I knew that I could do it, it was just 12 more docks away. I had the wind against me and the waves crashing into me. Yes,now only seven docks. I was a champion. 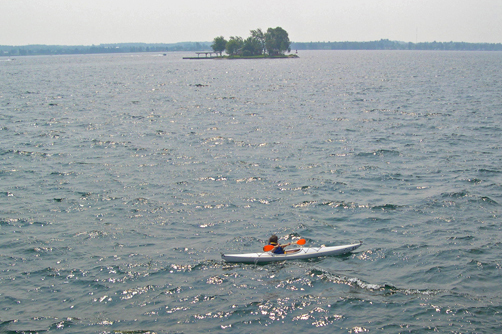 The first thing that came into my mind was I am the first 8 year old to kayak for 1 ½ hours in the St Lawrence River all alone after her instructor left her. I was almost at the dock. I was now paddling at full thrust. However, I wasn’t going any faster. I was only getting slower and splashing myself. My mouth had water in it and I was drenched. My kayak was filled with water and my feet were wet. Finally I reached the dock and my parents were there. The first thing I said to them was. “I didn’t need any help, why did you send them out there I was fine” I commented in my bratty tone. “Sorry, we were just trying to make sure you were all right” my dad replied being a comforting parent. We went home with my parents having a smile on their face. They were extremely proud of me making it back alone and only being 8 when a 12 year old was being towed the whole way there and back by the leader of our group. I had a smile on my face too. I was proud of me!